As a landlord or property manager, you likely already know that providing a rent receipt is highly recommended and even required in some states. However, knowing which rent receipt template to choose and what information to include on it can prove to be challenging and perhaps even overwhelming. Using the information and free rent receipt templates below as your guide can help you find and even customize the right option for both you and your tenants. Also referred to as rental invoices, rental receipts are forms used to record payments made for rent, and serve as an important recordkeeping tool. Once a rental agreement is signed, both parties are legally obligated to honor the terms listed. Included in these terms is the payment of rent by the tenant. Having a rent receipt documents when this obligation is met. 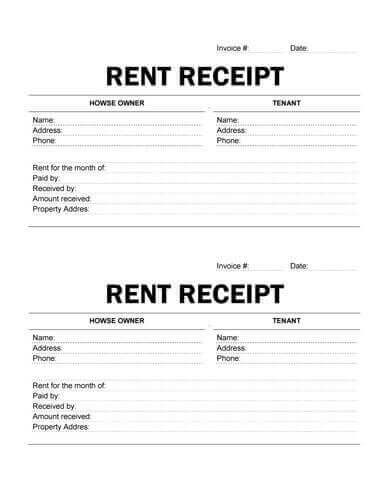 While there are different rules and regulations among states and countries regarding rent receipts, it is always good practice for landlords to provide them to tenants. In the U.S., many states require landlords to provide tenants with rent receipts, free of charge, whenever they are requested. This rule may also apply to previous tenants who can request receipts within one year of having moved out. You will need to review your state or country’s laws to verify if providing a receipt is mandatory or required only upon request by the tenant. 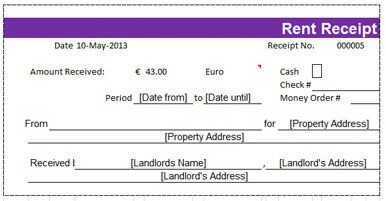 Failure to provide rental receipts when it is required by law can result in the filing of complaints by the tenants to local authorities, and fines being assessed against you. Also note that, if you provided a rent receipt for a tenant’s check that was returned uncashed for any reason, you may still pursue collecting that rent. Basic rent receipt with key information. The template should be used for rentals where partial payment is accepted. Two receipts per page (copy for landlord and copy for tenant), and place for company stamp. Just like you receive receipts for everyday purchases, such as groceries and gas, it is just as important, if not more so, that you receive a receipt from your landlord or property management company for payment of your rent. For most individuals, your monthly rent is one your highest expenditures, so being able to document proof of payment is important for many financial reasons. In addition, requesting a rent receipt is not only a wise financial move, it may be one of your tenant rights, depending on the state you live in. 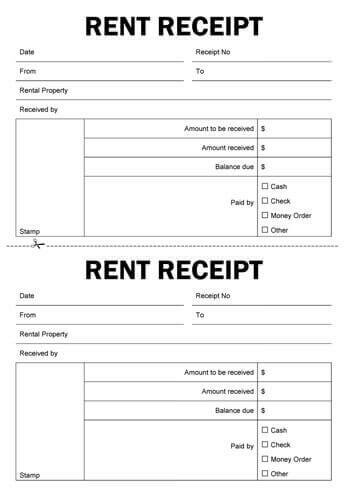 Another basic version of a rent receipt / rental invoice. Both editable version (Word) and printable (PDF) are provided. Verifying payments, particularly those made in cash. No matter how you make your rental payments, receipts should be provided and kept. However, rental receipts are especially important for tenants who pay in cash, since aside from receiving a cash receipt there is no other paper trail. Tax credit– Some states provide tax credits for renters. Having your rental receipts ensures you can verify that payments were made, making your tax credit easier to claim in the event additional documentation is needed. Credit reporting– Reporting rental payments that have been made on time and in full can help raise your credit score and demonstrate to lenders that you are trustworthy in paying your debts. Rental history– When reviewing tenant applications, few factors are more important to landlords than your rental history. Having your rental receipts can help show that you have a positive payment history or can help you to dispute discrepancies that may appear on your credit report. Dispute settlement– In the event there is a discrepancy regarding your rental payments (e.g. late, partial or no payment disputes), having a copy of rental receipts can help sort out and avoid possible issues, including late fees, evictions, and negative reports on your credit. This rent receipt form in Excel will save you a lot of time because it does all the work for you. When you enter amount due and amount paid, the balance due is calculated automatically. Enter numeric amount received and it will be converted into words. There are two worksheets: the first one has one receipt. The second has three receipts where two copies are automatically populated from information you entered into the first worksheet. Free receipt template with option for different currencies. There are two worksheets: one with one receipt per page and another with three receipts per page where two are populated automatically with data entered into the first receipt on the page. 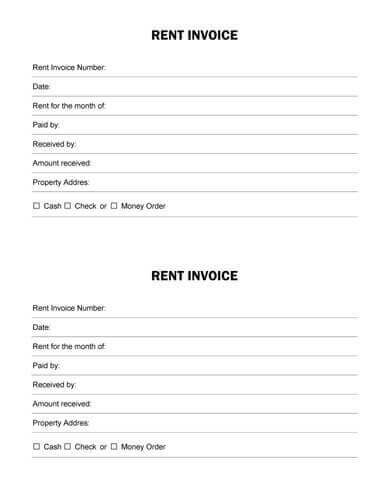 Basic rent invoice with two copies per page. Neutral style to accomodate any type of rental business. Create your own carbonless receipt book with this template. Each receipt features sections labelled Date, From, Receipt Number, Amount in figures and letters, Payment for, Rental period (to - from), Received by, Outstanding Balance due, and Signature. 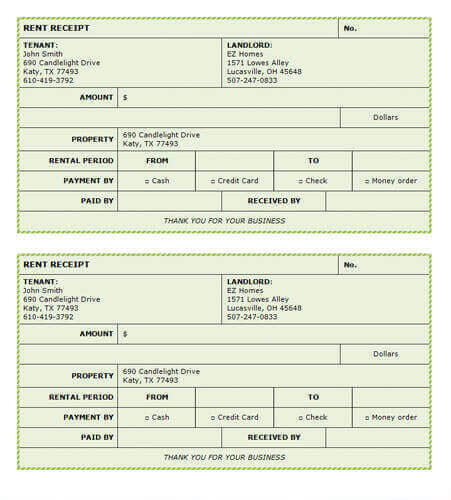 Blank receipt form with minimal design - easy to use and appropriate for any type of private or commercial lease. Universal template that can be used for various rental businesses - just change a few fields if provided fields are too many / too few for your business. 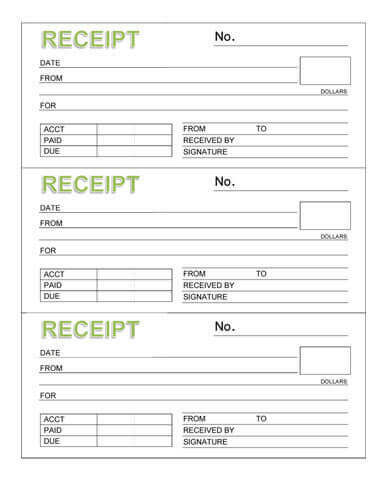 A single page cash receipt template with two receipts and a tear-off line. Check-like design with two receipts in a professionally-looking elegant table. This sample invoice is a document to justify payments made by a tenant during a certain period that can be used by tenant for tax purposes.